How do I manage CALPADS Fall 1 Student Information in Infinite Campus (Step 1 of 3)? General Demographics are entered to enroll students in your school and to create a schedule for the student. However the CALPADS Student Information is what is required by the State of California to report during the Fall 1 Submission and Certification process each year. 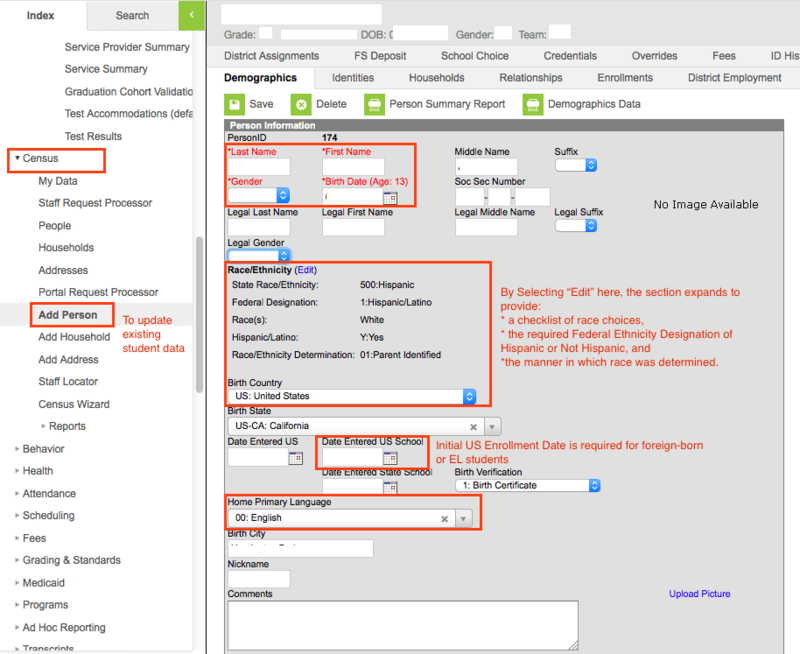 Once you have selected a student or group of students for whom data may be missing, you may follow the sections below to access the exact student information that is required for CALPADS. Within Infinite Campus, you may update individual student records from the Index by selecting Add a Person under the Census category. From there find the student by searching for the Last name or State Student Identifier. Much of the information housed on the Demographics page will be placed into CALPADS. See screenshot below. The red boxes indicate CALPADS requirements. This is a required field for first and last names. Use the students LEGAL name as it appears on the birth certificate. Middle name is optional. Do NOT use special characters when entering student names as CALPADS will not recognize them and it does create a fatal error. This is optional but helpful in identifying a students SSID. The date of a student’s first enrollment in a kindergarten through twelfth grade public or private school (including any home schooling in grades K-12) in the United States of America and Puerto Rico. This does NOT include United States territories. Required but can only be blank or checked. Under the Enrollments tab, there are several fields required to ensure information is placed in CALPADS for the current enrollment period. For Students Receiving Special Education Services, complete the remaining section of the Enrollments tab. Required information for CALPADS is outlined with red boxes. 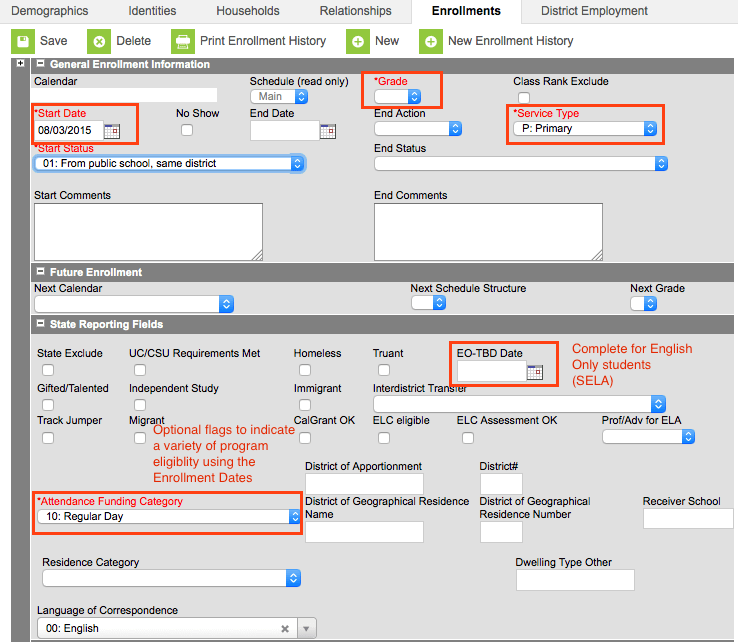 This may not be your primary source of Special Education data, but these fields are required in Infinite Campus to open the appropriate Student Programs in CALPADS. You now have the basic Student Information necessary for CALPADS enrollment (SENR) and student information (SINF) reports. The next step requires English Language Acquisition information (SELA), which was started in this step, and entering Student Programs (SPRG) such as Free/Reduced Lunch, Transitional Kindergarten, 504 Accommodation Plans, etc. which are also required for Fall 1 certification.